Now slightly revised from the original, and with the new MLS badges on the sleeves, I humbly present my own NYCFC kit concept. 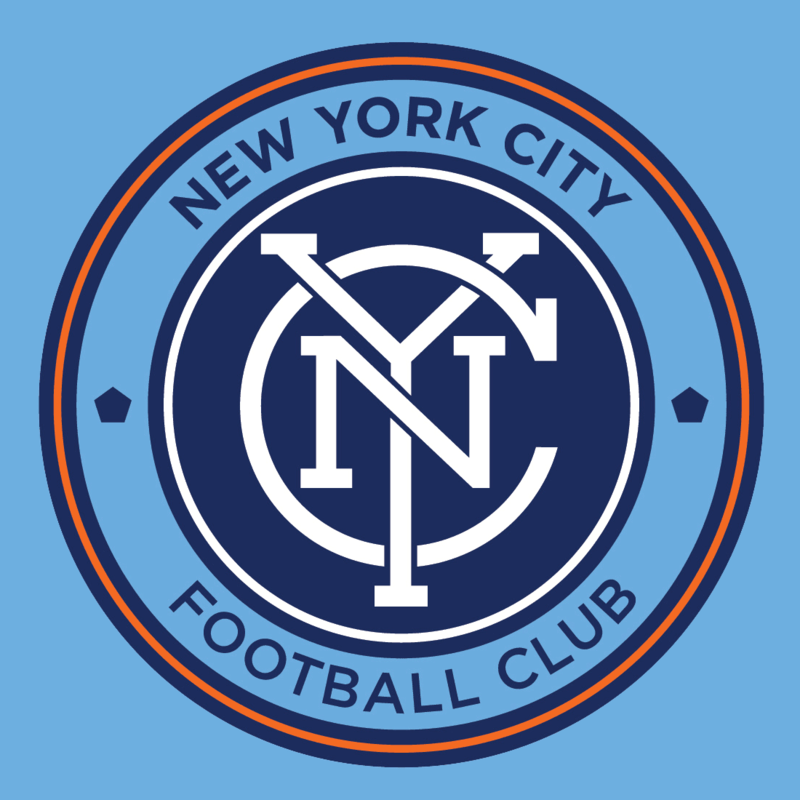 The colors come from our ownership group; one each from Manchester City and the Yankees, to create a color profile unlike anything currently seen in New York sports. I remain convinced that the club will announce a sponsorship deal with Etihad Airlines (I'm equally convinced that's a mistake), but hey. My concept, my sponsor. 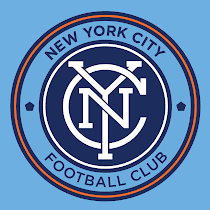 Although I would greatly prefer the team to go sponsor-less for the first season to let their own brand take root before diluting it, I bow to reality. They're going to do something, so in that case I like the idea of promoting the municipality as a gesture of goodwill from our newest team to the city it calls home. Aside from the sponsor, I stuck with a simple, clean template. Well, as clean a template as you can have with those three signature stripes everywhere. Collared, to pay homage to the sport's history. 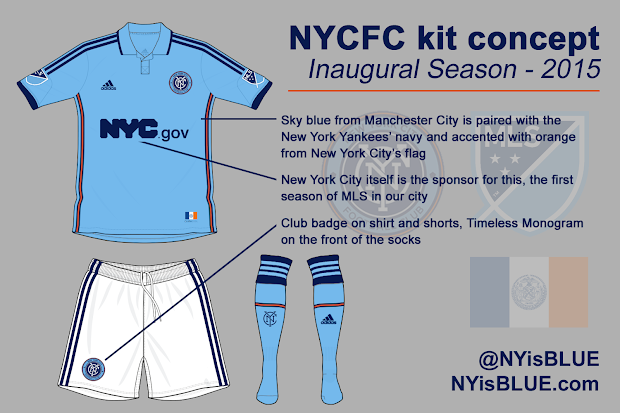 I myself prefer contrasting stripes to a monochrome kit, and white sets off the sky blue. The piping down the side of the shirt echoes the navy/orange/navy rings that border the club's crest. I didn't want to use much orange on the shirt (we'll save that for the change or keeper's kit), just a touch here and on the socks. And always bordered by navy. It was important to me to find a place where the "Timeless Monogram" could be used by itself. It's a strong mark, deserving of a little exposure. We have the badge on the shirt, repeated on the shorts, so the socks seemed a perfect place to put it. Finally, I added a little NYC flag to the jock tag. 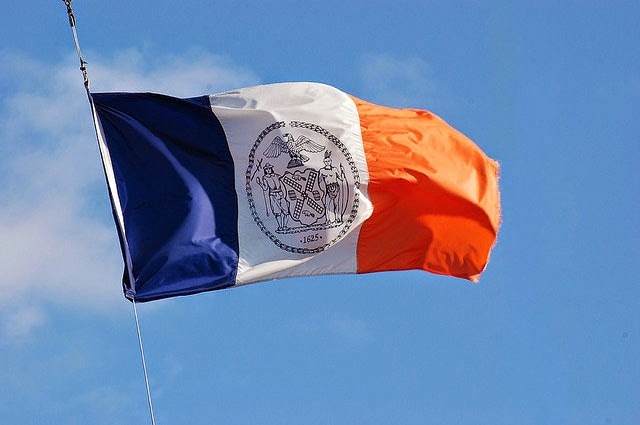 I've long thought that our city flag looks especially good against a sky blue background. This is, of course, what I would like to see. Not necessarily what I expect to see. By now, we can sure that the actual kit has been finalized, so as to have merchandise ready by the time of the announcement. We'll see what they've come up with soon, perhaps within a few weeks. See You at the Third Rail's Halloween Party!